The ongoing crisis in the US-Pakistan relations gives us a chance to look at the situation from a broader perspective. A NATO air strike on a Pakistani border coordination center on 26th November, which annihilated 24 Pakistani soldiers, has caused extensive coverage in the media and critical feedback from all over the globe.In a phone talk with his Pakistani counterpart, Russian Foreign Minister Sergei Lavrov stressed that violating other countries` sovereignty, including as part of counter-terrorism operations, is inadmissible. In his article special to our Strategic Culture Foundation web site, Indian foreign policy analyst M.K Bhadrakumar noted that ''the U.S. blundered into a Pakistani trap''. Certainly, experts are at liberty to assume that the U.S. army had its plans upset (and this is not for the first time, isn`t it? ), and that some notable individuals within the American elite, esteemed Congressmen included, wanted to teach an ''obdurate'' and “ungrateful” ally an unforgettable lesson (I wonder if they are equipped intellectually to take such crucial and far-reaching geopolitical decisions). Political pundits may also talk about the rift between 'professionals' and 'amateurs' in the U.S. foreign policy establishment (and did not the “noiseless” resignation of the “bipartisan” secretary of defence Robert Gates point to the unavoidable split inside the ruling circles in America?) It is hard to imagine now that the Bonn Conference on Afghanistan 5th December would be productive without Pakistan`s attendance, and that a US-elaborated draft project designed to revive the ancient "silk road" through Central Asia, which was recently rejected during a conference in Istanbul, will be reconsidered with enthusiasm. Nevertheless, it is up to US and its strategic allies to ponder over these issues. And I’d like to focus on different matters. The ongoing crisis in the US-Pakistan relations gives us a chance to look at the situation in the ''Great Central Asia'' (a definition given by the American strategic thinkers to the territories of South and Central Asia, as well as Afghanistan and Iran) from a broader perspective. Firstly, it has been quite long since the US-Pakistani relations entered a critical phase. Put differently, this crisis is rooted in Washington's long-term objective to regain its control of Pakistani foreign policy (since this country is a pivotal state of the 'Great Central Asia' region) and Pakistan`s growing resistance to the U.S. political pressure. The national development imperatives require that the Islamic Republic of Pakistan today is to focus more on the diversification of its foreign policy (including its economic ties with the outer world) and concentrate mainly on domestic issues. The Vision 2030 strategy was adopted in Pakistan in 2007, which outlines the following social and economic goals of strategic importance: 1) the annual economic growth to reach 7-8% 2) the per-capita income to rise from the current $925 to $4,000 3) the literacy rate to be elevated to 100 percent and to ensure free access to primary and secondary education for all citizens 4) to develop the middle class society 5) to eliminate poverty and to provide equal distribution of economic growth between all social classes. Evidently, such large-scale objectives require from Pakistan to minimize its participation in all kinds of military activities under foreign auspices. 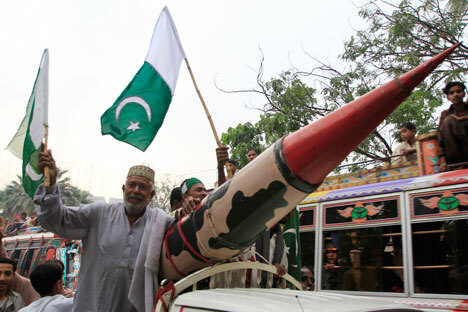 Secondly, U.S. - NATO air strikes have sent anti-American sentiment high among the Pakistanis, not among Islamists alone. The latest military action was counterproductive from the view of the US’s long-term interests in Pakistan, and was vehemently opposed by the youth. As Pakistani analysts ironically say, air strikes are ‘substitutes’ for assistance to Pakistan’s development goals amid its rapid population growth. With its 230-250-million population envisaged by 2030, Pakistan is going to be ranked the world`s fifth most populous country. Under the speedy demographic growth, radical Islamist views are becoming exceedingly attractive among Pakistani young people who have nowhere to use their skills and talents. This way or another, Chinese policy may be viewed as antithesis to that of the United States, with Beijing developing diversified cooperation with Pakistan, including its most troublesome regions. Both Beijing and Islamabad share the understanding that the U.S. ‘Great Central Asia’ strategy, in its most up-to-date manifestation of the “new silk road’’ concept, is targeted at prevention of China and Russia from strengthening their presence in the area. This bilateral accord might be instrumental to the encouragement of economic collaboration between countries of the region. Thirdly, the regional economic institutions, such as the Shanghai Cooperation Organization (SCO), are taking on a brand new strategic meaning nowadays. By rejecting in Istanbul the US-backed draft project aimed to revive the ancient "silk road" through Central Asia, Pakistan (and it was backed by Russia, China and Iran) clearly made its choice to boost economic ties between the region`s states. The leaders of these states seem to understand that reforms and development are the most effective way to fight terror. The reforms should be aimed to enhance economic growth, reduce unemployment and provide relatively equal and politically safe distribution of the national income. Having closed its borders to NATO and US military supply routes to Afghanistan, Pakistan demonstrated to America that active social and political cooperation with the neighbors would be the best option for settling the Afghan issue. - to have a clear understanding that territorial disintegration of the only Muslim nuclear state will have a catastrophic impact on the entire world. So, development is the only way to ensure the country`s unity and territorial integrity, which stipulates the involvement of retarded rural areas into the process of national economic modernization. On this stage of evolution in Pakistani society, military alliance with the US appears absolutely useless. Finally, the current Pakistani-US crisis is about the existence of a lot of differences affecting geopolitical cooperation between the two countries, and not only between them. Islamabadhas been demonstrating convincingly that America is not strong enough to reduce Pakistan to a state with “limited sovereignty” status. In a nutshell, we can see with our own eyes how the world is approaching a polycentric model of existence. That is why I tend to view the November 26 NATO bombing as a kind of a watershed between different stages of the global political development.